The number of subscribers gained by US OTT-TV service providers fell off a cliff in Q3 while subscriber losses by "traditional" pay-TV companies sped up. The bottom line: Cord-cutting does not appear to be slowing down. That was the conclusion presented this week by MoffettNathanson LLC analyst Craig Moffett in his quarterly "Cord-Cutting Monitor." Moffett stressed that the trend is not completely clear-cut because several virtual MVPDs, including PlayStation Vue, Hulu LLC and YouTube TV, don't announce or reliably provide their live-TV sub counts. But when balancing estimates with the reported numbers from other OTT-TV services, such as DirecTV Now and Sling TV , it's still pretty clear that growth in that category dropped off bigly in Q3. With traditional US pay-TV and OTT-TV providers factored in, Moffett estimated that the overall sector lost 709,000 subs, down roughly 0.7%. The traditional pay-TV grouping, which includes the cable operators, telco TV and satellite TV providers, combined to lose 1.12 million subs in Q3, widening from a loss of 870,000 a year ago. While that represented a record rate of decline, satellite took it especially hard on the chin -- losing 726,000 subs in Q3, while cable saw Q3 sub losses narrow to 293,000 versus 322,000 in the year-ago quarter. Telco TV losses improved to 104,000 versus 202,000 in the year-ago period. Moffett estimates that the virtual MVPD group added 414,000 subs in Q3 (extending the grand total to 6.45 million), well off the 909,000 subs gained a year ago. Among individual virtual MVPDs, DirecTV Now gained just 63,000 subs (excluding free trials) in Q3, compared to an increase of 323,000 a year earlier. Moffett said Sling TV "positively unraveled" in Q3 2018, as it added 26,000 subs compared to 236,000 adds in Q3 2017. Moffett said the reason for the sub slowdown in the OTT-TV arena is hard to pin down, but suggested a set of contributing factors -- recent price increases, retaliation from legacy pay-TV providers, and "exhaustion from consumers who are disenchanted that vMVPDs aren't quite what they were cracked up to be." But the bigger picture is that the rate of decline for all distributors hit a worst-ever -3.7% on a year-on-year basis, Moffett said. While raw sub numbers paint part of the picture, household formation trends fill it out. Citing data from the US Census Bureau, Moffett said new household formation was much weaker in Q3 -- net adds of 114,000 versus 224,000 a year earlier. That's important, he said, because stronger household formation typically means a greater number of pay-TV subscriptions. "Absent the benefit of stronger new household formation, the underlying rate of decline would have been even worse," Moffett wrote. 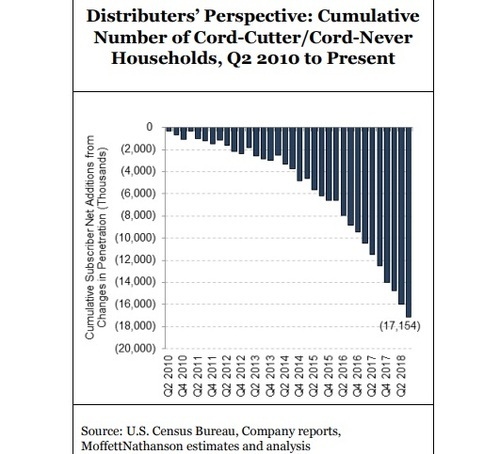 "To the extent that we are not seeing these new households in the subscriber data, we can conclude that cord-cutting has accelerated more than it appears based on the reported subscribership data alone." Moffett suggests that a "false narrative" surfaced last quarter that cord-cutting was slowing down, because the housing formation trends weren't given the full credit they deserved. "New household formation played an unbilled but starring role" in why pay-TV's rate of decline seemed to improve in Q2, Moffett noted. When those housing trends are given their proper weight, Moffett comes to this conclusion: "Cord cutting does not appear to be slowing at all." Moffett estimates that there are now 17 million homes that have cut the cord or have never taken a traditional pay-TV service. There's also more than 10 million that don't take any sort of pay-TV subscription, even from an OTT-TV provider, he said. How is this Spam Post Below Still Up? The service being described is obviously illegal yet LightReading allows the post to remain? so after ten years at $447monthly is a savings of at least now $365 monthly or $4,338 annually; or $21,942 after five years, or $43,885 after just ten years; or $87,770 after just twenty years or $175,541 after just forty years; so I have effectively opted out of all that nonsense buy cutting the cord on Comcast Cable TV altogether entirely and completely; and guess what I have never been happier and my only regret is not having done this even sooner!! !